The MacGregor Family: Annyong aka 2.0 aka ??? Annyong aka 2.0 aka ??? On Friday Noelle will be 37 weeks. Annyong's due date is March 11. Wait. Make that - was March 11. Today we had an ultrasound (our first once since 20 weeks) and got to see our little buddy again. Everything looked great, but he's a big baby. Flashback: Jackson was born a little over 2 weeks early and was 8 lbs 9 oz. Noelle was induced early because of preeclampsia. Despite being early, he was a big baby! This time preeclampsia isn't an issue. But, if this baby goes 40 weeks, we are scared at how big he may be! The ultrasound today estimated that this baby is almost 8 pounds already with Noelle's due date over 3 weeks away. Yikes! Although estimating the weight based on the ultrasound isn't the most accurate estimate, it was pretty accurate with Jackson and this baby's weight is pretty similar to Jackson's at this stage. Looks like this baby might be coming sooner rather than later. Looks like they are now thinking he will be born next week. Noelle also had an exam and it looks like her body progressing as well and getting ready to have this baby. Although we're excited to see him - we are NOT ready!!!! We don't even have a name. 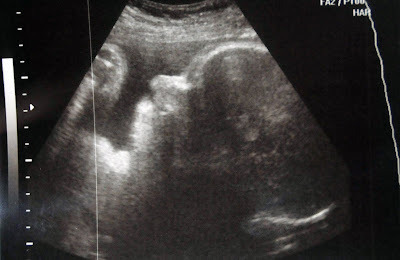 Below are some of the pictures from the ultrasound. 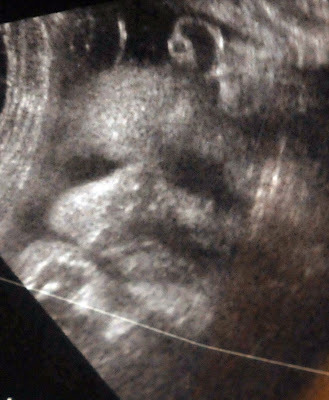 Typically I think ultrasound pics are pretty creepy. The second one is especially creepy, but kind of neat at the same time. The two black circles are his eyes and under his chin you can see his hands on his chest. Awesome pics!! Don't worry... William was 8lb. 7oz. (i think) and Neil was 9lb. 5 oz. Neil shot out at the speed of light with barely any pushing on my behalf. It was a VERY easy labor (as easy as labor can be) compared to the 36 hour ordeal of William. If 2.0 is bigger, I am sure he will just slip and slide his way out with ease. I know Rob is now shaking his head at that comment. Hee Hee!!! Damn it.. I was still signed in under the MOPs email again!!! The above was from Penny! !